State regulators unveiled a website Tuesday that should allow homeowners to compare rates on home policies in all 67 Florida counties. The governor said the website's rate comparisons will make ''transparent and abundantly clear'' the costs for similar policies from different insurers. As the governor and Insurance Commissioner Kevin McCarty unveiled the website, they admitted that the rate cuts promised by insurance reform legislation passed in January hadn't been as large as expected by regulators and lawmakers or promised by insurers. Allowing consumers to shop around for an insurer could provide a way of saving money. Rates being charged by major home insurance companies have gone down only 10 percent since the legislation passed -- not a lot compared to how much they have risen since the 2004 and 2005 hurricane seasons. Some customers saw their rates double or triple in the last few years. Gov. Charlie Crist, right, and Insurance Commissioner Kevin McCarty announce Tuesday the launch of the Shop and Compare Rates website that helps consumers compare homeowners insurance rates throughout Florida. However, both Crist and McCarty pointed out this was the first time rates had actually declined after these steep increases. In the afternoon, the governor came to Miami for a ceremonial signing of the insurance bill passed by lawmakers in early May. The bill freezes rates for Citizens Property Insurance, the state-run insurer, through 2008 and gives homeowners the option to select coverage from Citizens if a private insurer's rates are 15 percent higher than what the state company would charge. The bill also lets Citizens write full homeowners policies -- rather than just providing windstorm insurance -- in the higher-risk areas of the state. 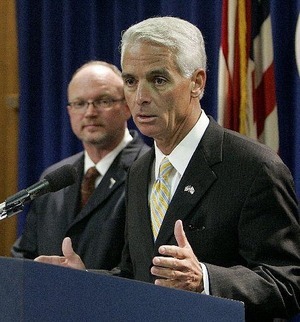 Crist and several lawmakers believe that by letting homeowners choose between Citizens or a private insurer, there's more competition in the market and private insurers could be prompted to lower their rates to retain policies. The new website should give homeowners an idea of what different insurers charge for similar policies. But the rates given are countywide averages. Because a variety of factors are used by insurance companies to price a homeowner's policy, the rates on the website won't be actual costs. The website used an example of a $150,000 home and included 25 companies -- major insurers as well as newly formed companies that have promised to write homeowners policies. The insurance commissioner said the website will have rates for a $300,000 home in a few weeks. McCarty said the website will be updated, with new insurers added as they are approved by the Office of Insurance Regulation. McCarty cited an example of a home in Pinellas County (Crist's home county) where policy costs ranged from a high of about $4,000 to a low of about $1,800. Crist said he hoped most of the insurers cited in the example on the website would be writing policies so homeowners would have choices.